It’s August, and that means that worldcon is coming around once again. (In a properly ordered universe, worldcon would be coming on Labor Day weekend but sadly that seems to be a lost cause since Dragoncon stole those dates). This year’s gathering is in San Jose, California. It ought to be called ConJose II, but it’s not. I like my worldcons to have names, not numbers, however, so I refuse to accede to this new twitch of numbering cons instead of naming them. 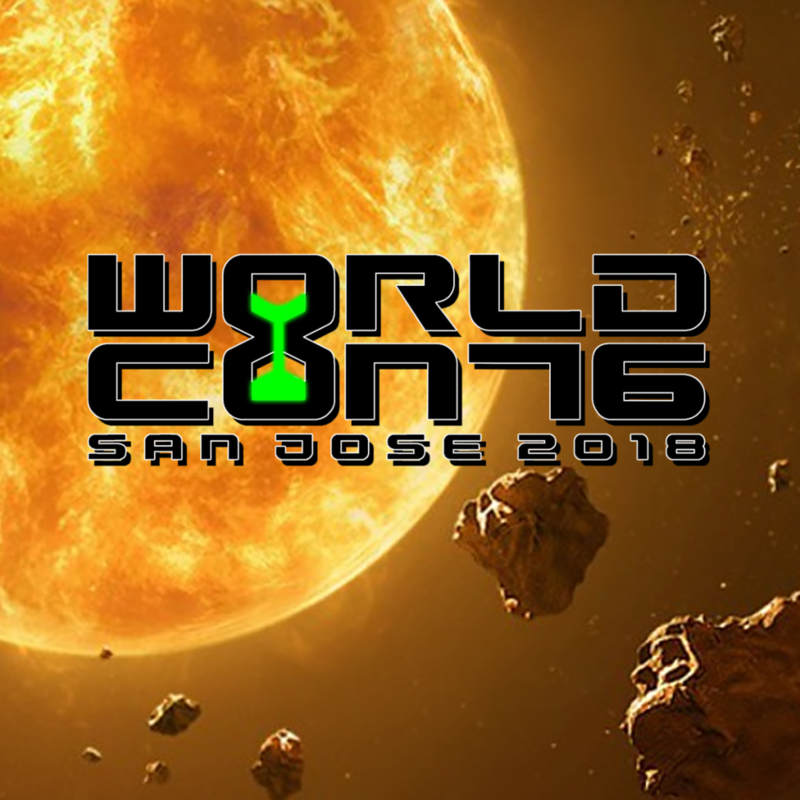 The SanJose folks keep insisting that this worldcon is not ConJose II, though. So be it. In the tradition of my Not A Blog, and of course the famous John W. Campbell Award (Not A Hugo), I shall henceforth refer to this year’s gathering as Not ConJose II. I have cut way down on the number of cons I attend, due to the press of work, but there’s no way I’d miss a worldcon, by any name. I’ve only missed one in the last thirty years. Dragoncon and San Diego Comicon and GenCon and many other cons are now much bigger, but worldcon remains the original, and the best, the heart of the fannish community. Worldcon is like a family reunion. And yes, like any large family, we have our share of drunken uncles, loony cousins, and snot-nosed kids… but still, family is family. I’ll be there for the whole con. I hope to see many of you in SanJose. Worldcon is great time for getting together with old friends and making new ones. I know that some of you will be hoping to get your books autographed at the con. There will be several opportunities for that. My week will start on Tuesday, August 14, with a special fundraiser on behalf of LOCUS, an evening with John Picacio. That event is not an actual part of the con, so tickets will be sold separately. I will not be signing at the fundraiser, no… but we will have hundreds of pre-signed books available for purchase at the event. I also have three scheduled signings at Not ConJose II itself. Friday at noon and Sunday at 1pm, I will be signing in the official autograph area. The lines will be capped, however; there’s a limit to how many books I can sign in an hour. (No, my hand doesn’t fall off. It’s my lower back that protests). Sorry, I can’t do personalizations or inscriptions, and we have a limit of one book per person. Mind you, if the lines are short, I will sometimes loosen the rules and sign a second book, etc. Don’t count on that, though; my lines have not been short in years. Oh, and yes, I will sign things other than books. Games, cards, replica swords, photographs, program books, interesting body parts…. but still, only one item per person, and no personalizations. And I don’t sign babies, pets, or books written by other authors. Besides these two general signings, we also have the Wild Cards signing, scheduled for Saturday morning at 10am in the dealer’s room. That’s a mass signing. Melinda Snodgrass, Caroline Spector, Marko Kloos, Mary Anne Mohanraj, Kevin Andrew Murphy, and several other Wild Cards writers and creators will be joining me, to deface your books with their illegible scrawls. But at that event we will be signing ONLY Wild Cards books, so please don’t bring copies of any of my other works… those you can get signed at the general signings. I do prefer to limit my autographing to these four scheduled events. I want to enjoy worldcon like everyone else, without having to scrawl my way through it. So please do not approach me before or after panels, at the Hugos, in the corridors, at the parties, while I’m having dinner (or breakfast, or lunch), or in the restrooms to ask for an autograph. Your understanding would be much appreciated. Aside from signing things, what am I doing at Not ConJoseII? you may ask. At 5pm on Friday I will be part of the Gardner Dozois Memorial. A sad event, but I think we’ll have some laughs as well. Gardner was the funniest man in our field for half a century, he’d want to hear us laughing. There’s also to be a Wild Cards panel, though I am not sure just when. The present time is a conflict for me. Depending on where the panel gets moved, I may or may not be on it. But there will be a Wild Cards panel regardless. Oh, and keep your eyes on Thursday. We’re looking at doing a presentation and trailer screening for the new NIGHTFLYERS television series that debuts this fall. Details are still being worked out When we have more definite news, I will let you know. And that’s it, so far as my public participation in Not ConJoseII is concerned. But of course, I will be there all weekend, wandering the dealer’s room, drinking in the bar, visiting the art show… and, of course, hitting the parties. That’s what worldcon is all about. Will there be a losers’ party this year? I hope you have fun there. By any chance will you be doing interviews/podcasts while you are there? I won’t be there but I’d love to read/hear those. On a different note, Will you do a tour for F&B? Maybe a book singing in NYC? I will not tour for FIRE & BLOOD… not one of those month-long twenty-city grinds, anyway. I may make a couple of appearances, maybe one on each coast. I don’t know. There’s a lot to be worked out. World Con should be on everyone’s bucket list. My dream is to make both a WorldCon and DragonCon in one year (now with WorldCon “floating” a much more feasaible dream). Sunny Cal a bit too far this year, but I keep voting for eastern locations (Chicago was great). Both cons have a different and equally wonderful vibe. Will be running lots of miniature wargames in our Battle for the Iron Throne campaign at DragonCon (as well as marching in the parade in a “book character” costume surrounded by all the HBO versions. Have a great WorldCon Mr. Martin given SF/fantasy’s losses this year I think its high time we made some new memories (other than writer’s cramp from endless autograph sessions). Wish I was there…. Some of it is just an excess of enthusiasm, to be sure. One tries to be understanding. Supposedly, when they chopped off Louis XVI’s head during the French Revolution, several onlookers ran forward to collect some of his blood. That seems like a good barometer: when the fans start collecting your bodily fluids, things have gone too far. I did once have a fan try to sneak up behind me with a pair of scissors to cut off a lock of my hair. That was back when Ty Franck was my assistant, and Ty saw him, stopped him, and wrestled away the scissors. This will be my first Worldcon, though I’ve been to plenty of conventions. I am very excited to see everyone in the community again, ask you another question at the Q&A, and go to some of my favorite places in the bay area again at long last. Also quite excited about The Expanse themed bar that will be at the con! I recently read chronologically through this whole Not a Blog in like two weeks, i’d guess. Entry after entry, month after month; just skipping over a few posts here and there, whenever i wasn’t interested in the topic. In 2013 there was a video linked. It was a video from a Capclave panel called the “The Howard, George and Gardner Show”, which was such a delight. I advise everybody to check it out; you can find it on YouTube. In this two hour video, these three older gentlemen – Howard (Waldrop), George (Martin) and Gardner (Dozois) – fool around a bit and tell stories from their past. You get know them a bit, and they grow on you. Especially that fella on the right side, called Gardner Dozois. You gotta love his running gag. And you just feel, that he has told it a thousand times before; and still enjoys it every inch. Then a few days of reading – and a couple of years of blogging – later, i had to learn, that this fun-loving guy had passed away. And i was sad. Which was a little bizarre to me, because i really just knew him from that two hour video. Maybe i will get a book of his some day. Or watch that video again. Not just right now. If there will be a recording of the panel of the mentioned Worldcon memorial, where people remember him and share amusing memories, i think i’d like to watch that. I hope so. Some worldcons videotape everything. Some do not. Has… has anyone asked you to sign a pet? Yes. Though to be fair, they don’t usually want me to sign the animal itself. But doggie sweaters, cat collars, that sort of thing… yes. Yes. Of course. I never miss worldcon. I will be at New Zealand in 2020 as well. Are you done with readings for the foreseeable future? One thing I would like to cross off the bucket list would be to hear you read one of your chapters live. Good luck in San Jose and all the best. I am not reading at Not ConJoseII. I may do readings next year in Dublin, or at other conventions, but that’s too far in advance to worry about. I do enjoy reading, but I’ve already read so many different chapters from WINDS, I want to save some for the book. You should call it NoWay ConJose II. Do you know if John Picacio will be signing at that first event? 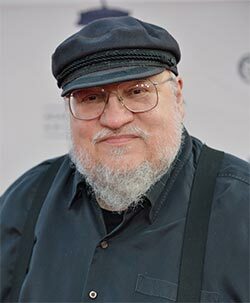 Speaking of signing books, the 20th-anniversary aGoT book seems like a very nice version to be signed… will there be a 20th-anniversary version of A Clash of Kings? Maybe in 2019 to coincide with the 20th anniversary of the USA release? Enjoy San Jose!